GREENWICH, 205 GREENWICH AVE. CALL 203.862.5300, VISIT SAKS.COM/GREENWICH, DOWNLOAD THE SAKS APP OR FIND US ON FACEBOOK, TWITTER AND SAKSPOV.COM. PHOTO BY JOSHUA MCHUGH; INTERIOR DESIGN BY MADELINE STUART & ASSOC. 71 Venü Magazine’s showcase for fine furniture,textiles, jewelry, art, antiques and accessories. Showcasing local Arts, Culture, and Style without any contrived formality. 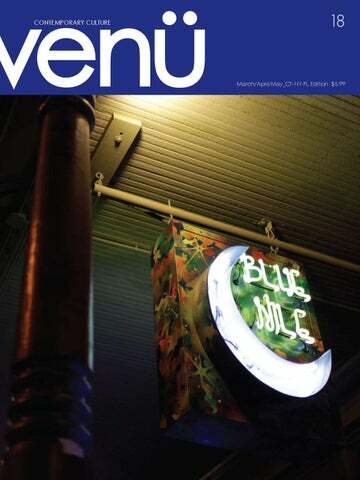 VENÜ is published six times a year as a fresh yet discerning guide to art, culture and style throughout Connecticut and beyond. Not too artsy or too fussy, we’re thoughtfully written for the curious, the acquisitive, and those devoted to the one-of-a-kind and hard-to-find. Contributors Wanted At its core, VENÜ Magazine is about giving Ü insight to all that’s original and inspirational. Fluent in Italian, Spanish, Slovene, and some French and German. With over 20 years of experience in all facets of Real Estate whether Buying, Selling, or Leasing. In all stages from Planing, Zoning, Renovation and Project Management, Interior and Exterior Design, Property Management, Contract Negotiations, Commercial, Residential, or a Sale of a Business, you can feel confident and secure that I will represent your best interests, and want to be your trusted Real Estate Adviser and Professional. Licensed in Florida and New York State. create pieces of true quality, comprising classical elements that would be both timely and timeless—even if that meant the process would take longer.” Each design in the collection began with Bedell’s concepts or sketches, which were then translated into CAD, and prototyped with 3D printers. In stark juxtaposition to this modern technology, Korbella employs the ancient method of lost-wax casting to create its beautifully detailed pieces. The amount of handcrafting is extensive, as each Eiffel Tower artifact is cut by hand, carefully sanded, polished, and sealed with lacquer. Skilled artisans then frame the precious Eiffel Tower “diamonds” and discs within .925 sterling silver, 18k gold vermeil, or solid 18k gold. The jewelry is created entirely in the United States, with the exception of the clasps, which are sourced from Italy. “I’m told the best clasps come from Italy, and as I’m part Italian, I’m inclined to agree,” says Bedell with a smile. The pendants and charms are cast in New York and the chains are made in Rhode Island, where the pieces are also set, polished, and finished. A certificate of authenticity accompanies every design purchased from Korbella.com that includes a piece of the Eiffel Tower. “Everyone has their own Paris,” says Bedell. “We offer beautiful jewelry made from the most perfect icon of Paris, providing unique context: these are empty vessels, awaiting you to fill them with your memories, of your Paris.” While named Eiffel Tower Forever, the collection is finite; once the rare resource is exhausted, production will cease forever. Within the limited production collection, the Coeur de Paris (“Heart of Paris”) pendant is noteworthy as a true limited edition piece: only 500 silver and 300 vermeil pieces will be created worldwide. Korbella is also able to customize various elements of its offerings, executing the designs in different metals such as platinum or rose gold, or substituting gemstones, to accommodate customer requests. One of Bedell’s greatest joys in this pursuit is hearing from customers about “their Paris,” as they recount their experiences, memories, or dreams about the City of Light. Some write of a special evening and a memorable kiss at the Tower; others recall a romantic stroll along the banks of the Seine, a moonlight cruise, or a special picnic in a Parisian park. Regardless of the storyline—romance, inspiration, family fun, anniversary or wedding—there is a common thread of sincere emotion, as Paris manages to touch so many hearts, even those who have yet to visit. “Everyone has their own Paris,” says Bedell. “We offer beautiful jewelry made from the most perfect icon of Paris, providing unique context: these are empty vessels, awaiting you to fill them with your memories, of your Paris.” All Korbella designs are available exclusively at Korbella.com. For more information or to view or purchase the Eiffel Tower Forever collection, visit Korbella.com. them. The vodka they have created embodies that authenticity and purity of spirit – literally. This past June of 2012, Broken Shed made its US debut in the state where two of the three founders originated. The Connecticut welcoming was followed by a late-September 2012 New York launch, and both have been met with great accolades. New Zealand, long known to the world’s sports enthusiasts and travelers as a sought-after destination (and now associated with the home of that broken down shed and the vodka it inspired) made the welcome to our shores a warm one. As they have been asked and responded, “People think of New Zealand as rugged, beautiful and clean, so when you order a Broken Shed vodka from New Zealand, you’re saying I like the best, I like premium, I like clean, crisp, I like purity. You can spend a lot of money marketing vodka that might have the cache but not the quality or taste. Our feeling is that New Zealand itself is an inherently good brand and any products coming out of it must live up to its standard. ” Much is written about the connection between the geography of New Zealand and the iconic “Lord of the Rings” trilogies. Actor Elijah Wood, who stared in all three films, said of the region “There’s a real purity in New Zealand that doesn’t exist in the States. It’s actually not an easy thing to find in our world anymore. It’s a unique place because it is so far away form the rest of the world.” Perhaps only two fearless friends from Connecticut and kindred Kiwi could be intuitive enough to create this pristine spirit, and then bring it back home to share with all of us. In a time where marketing plans and advertising campaigns emphasize flash over substance, it is refreshing to know that there are three men who have the humility to name their creation after the shed where their idea was born. Broken Shed Vodka has consciously chosen a different path – one that is authentically and completely its own. Cheers! Diane Pollack stands in front of her wall installation of monoprints themed, women seen and not seen in our society. various forms – pond, lake, river and sea, and concerned about the survival of our natural resources and the many increasingly rare species. Both artists were inspired by the 800 AD poet Rumi’s work: We are the night ocean. Filled with glints of light. We are the space between the fish and the moon. From April 4 through May 4, Art/Place is “falling in line” by presenting “Drawn In”, an exhibition which explores and promotes the concept of drawing, planned in conjunction with the Aldrich Museum’s program “Draw On”. The goal of both organizations and other participating groups is to stimulate interest in drawing and encourage the public – even those with no art experience whatsoever – to approach drawing from a variety of different points. Art/Place will sponsor collaborataive and interactive programs, with materials provided, throughout the month. Events will be posted on the Website. Poetry is the inspiration behind two artists having solo exhibitions from May 9 through June 8. Diane Pollack’s theme is “women seen and not seen in our society”. Her installation of monoprints, some with hand-stitching will be accompanied with poems by Ben Johnson, Walt Whitman and others. Mary Louise Long’s abstract paintings and monotypes focus on brilliant colors and powerful forms, rendered with painterly markings. Her work is influenced by classical mythology and poetry, including poets as varied as Lord Byron, Rilke and T.S. Eliot. Elected by a jury of artist peers, New Art/Place members include Ishita Bandyo of Branford, Mollie Keller of Trumbull, Grace McEnaney of Newtown, Bevi Bullwinkel of Fairfield, Demitri Papolos of Southport, Ruth Kalla Ungerer of Westport, Elizabeh Nagle of New Canaan and Paul G. Larson of Greenwich. In addition to Zolan and Pollack, other members include Dave Pressler of Shelton, Phyllis Clamage of Stratford, Carole Cole and Elisa Khachian of Fairfield, Susanne Keany and Barbara Bernstein of Weston, Toby Michaels and Mary Elizabeth Peterson of Westport, Cate Leach of Darien, Sandra K. Meagher of Rowayton, Mary Louise Long of Stamford and Martha Reinken of Greenwich. Art/Place is open Thursday through Saturday, 12 to 4 p.m. and during special performances of the Fairfield Theatre Company. 70 Sanford Street, Fairfield. 203-292-8328. www. ArtPlace.org. The work of Art/Place members is also showcased in ongoing exhibitions at the Watermark Gallery at 3030 Park Avenue in Bridgeport, Connecticut. I thought this sculpture, Untitled, by Mark Swanson, was the perfect “disco ball” for my Panne stretch velvet jumpsuit. “So, where do you get your ideas?” People frequently ask me that. Because inspiration can’t always be pinned down, I tend to give them rambling answers. “It can be anything– the fabric, the music I’m listening to, something someone said, or a need I see in day-to-day life.” So, in general, my ideas come from anywhere. Art, however, is a constant. The worlds of art and fashion intersect, but although everyone wears clothes, once we finish grade school, and art is no longer something we ‘do’ or practice every day, we don’t always think we‘get’ art. I see art everywhere, in the cut of a skirt, the angle of a seam, the handle on a mid-century cup. Having not visited for a few years, I went to the New Britain Museum of American Art to see my friend Dalton Ghetti’s art project “3,000 Tears” unveiled, and I was floored at the museum’s collection. I turned the corner to Lisa Hoke’s “The Gravity of Color,” stopped in my tracks at the top of the stairs and said to myself “We need to do a fashion shoot here. How can I make this happen…” I felt NBMMA is bursting at the seams with amazing works, rolling out great beauty as you walk along, slamming you with exclamations of passion, presenting them in a way that lets you take it all in like a fabulous ride. In the main entrance our models play on a Howard Fromson bench to show off her Cowels Gone Wild silver sweater, Simple metallic wool tweed skirt, and his Waxing Poetic Waxed denim raincoat, Jens stretch pant in red cotton/lycra, Zip It lined sweater, Skimcoat lined t-shirt. The Benton room of murals at NBMMA is amazing. I wanted to show the full scope of what I did in one shot. The saturated colors of these paintings is in such incredible harmony with my fall collection, when I saw everyone line up for the shot, I almost cried tears of joy. The finished shot had a Wes Anderson Royal Tenenbaums vibe. Left to right, Crinkle in the Hood dress, Night Garden stretch top, Secrets pants, Mixed Media silk and wool dress, Milday Newpenny velvet dress, Glam Edge beaded brocade jacket, For the Birds Silk vest, Jens wool pant. I love the ceremony of putting on a dress to mark an occasion. Everything changes - how you carry yourself, your confidence, sometimes, how much fun you’re going to have. This is true if whether you’re age 6 or 60. The most important thing is that you’re physically comfortable, so although these dresses are formal, they feel like pajamas. This is my daughter Hazel, and she would wear this dress to Stop & Shop. Modern Princess: embroidered silk organza and Duchesses satin dress with beading. The Fairfield Community Theater–A Great Community Partner! Looking for something different to do? FCBuzz.org is the place to find out what’s happening in Fairfield County any day of the week—featuring theater, exhibits, music, history, science, family fun, classes and local artists. Click on FCBuzz.org. Pick a great event to attend. Then Go—bring your family, meet your friends or fly solo. FCBuzz.org™ is presented by the Cultural Alliance of Fairfield County. For more information contact the Cultural Alliance of Fairfield County by emailing info@CulturalAllianceFC.org, calling 203-256-2329, or visiting the Web site at www.CulturalAllianceFC.org. Children’s Theatre Company to present a series of children’s plays this year. The FTC venue has been host to numerous charitable events for local nonprofits seeking to raise money. The organizations include Near & Far, Connecticut Challenge, Pilot House, and Thomas Merton Center. Benefits have been held for those impacted by Hurricane Sandy and Sandy Hook Elementary. FTC also teamed up with Operation Hope, to collect over 5,000lbs of food through food drives held during shows. In terms of local community impact, the patrons who attend FTC productions each year have made a considerable difference to local businesses. Reid emphasizes, “Recent research says every patron who comes to a show at a venue like FTC spends close to thirty dollars at the surrounding businesses— going to dinner on the way to a show, or stopping for refreshments after a show. By bringing about 40,000 people a year through our doors, I think it’s clear that we are generating business for the area—about $1.2 million dollars in new revenue. With the community’s ongoing support, I see great things ahead for FTC, and that starts with community involvement!” Stay tuned and find out what’s happening at FTC and other great venues throughout Fairfield County by visiting FCBuzz.org. Top left: Robert Randolph and the Family Band. Far left: Cheap Trick’s Rick Nelson (at The Klein). Bottom: Jesse Crites and FTC’s Saturday Kids: KEYS Program Top right: FTC’s Saturday Kids: KEYS Program. Nadín Ospina, Casa de Xolotl,2005, stone, 26.8 inches high. Courtesy the artist. Ringing Out 2012... The scramble caused by Hurricane Sandy required cancellations & adjustments but did not deter Beechwood Arts friends as they rallied and celebratedwith enthusiastic gusto for our last 2 months of the year! Westport Library Innovates at Beechwood! We led members of The Westport Library staff through a pro-bono “Innovation Lab” using the same thinking that Jeanine uses with her corporate innovation clients. The team worked to expand their minds and collaborate on new ideas for the library, leaving the day with some developed, ready-to-go solutions. A mini concert by Frederic was their reward for a hard day’s work. Westport Historical Society puts Beechwood on its Holiday House Tour.. Tour-goers came to see Beechwood in its Holiday clothes and were fascinated by the unique mix of contemporary, edgy art in an 1800’s salon setting. They also loved the secret passageway that is said to once have been used in the underground railroad. All proceeds went to The WHS. ... And Looking Forward to an Expansive 2013 Beechwood Arts will focus on bringing our signature Arts Immersion Salons and other events to a wider audience... stay tuned! Beechwood Arts Immersion Salons: Live to a screen Near you! An exciting surprise opened the year when a generous patron stepped forward to equip Beechwood with the technology and equipment necessary for us to stream our Salons and workshops to a worldwide audience! Beechwood Arts NYC 70’s “Downtown” Birthday Bash! While the 70s were a gritty, bankrupt low-point in the history of the big city, a “Big Bang” of arts and music collaboration exploded in NYC’s Downtown Art Scene. We celebrated with a live graffiti artist, audience readings, a concert by Frederic Chiu of minimalist Philip Glass, art & talks from internationally renowned NY 70s artists Audrey Flack, Marisol Escobar and Larry Silver along with new contemporary artists whose work is reminiscent of the period plus NY-style wood-fired pizzas! Culinary + Art Perfect Partners! Beechwood Arts is starting to work with local Top restaurants to install gallery-quality art in their venues. A win for culinary hot spots that cater to an arts-sophisticated audience in Fairfield County, a win for artists who will have their work be seen in a setting mixed with culinary arts, and a great fit for Beechwood Arts and our mission of mixing these genres. First stop, Blue Lemon in Westport – a Top 5 restaurant (out of 70 in Westport) on Trip Advisor. Beechwood Arts on-line! We will officially launch our on-line gallery. Not just an on-line gallery, but a place where we will continue to curate an innovative mix of art, music, performance and culinary arts. We anticipate launching our on-line gallery by March. of the Spring Show since its inception three years ago and we are proud of our association with the dealers and the ASPCA.” “As we head into our third year, we are delighted to welcome back our partner 1stdibs and the ASPCA as our beneficiary,” said Clinton Howell, the League’s president. “We are particularly gratified to have the enthusiastic support of so many of new and returning dealers.” Howell also announced that Carolyne Roehm, the celebrated style arbiter, horticulturist and prolific author, will design the flowers throughout the exhibition hall. “If there is one person who embodies elegance, sophistication and taste, it’s Carolyne Roehm,” he said. “We are very fortunate to have enlisted her extraordinary talents to create an unforgettable ambiance for the Spring Show.” Ms. Roehm also joins the Spring Show as a Co-Chair, alongside Michael Bruno, Mario Buatta, David Patrick Columbia, Robert Couturier, Celerie Kemble, Edward Lobrano, Brian McCarthy, Miles Redd, Ellen and Chuck Scarborough, Michael Smith, Bunny Williams, and Vicente Wolf. Showcasing an astonishing array of wares-from ancient artifacts to fine furniture to modern masterworks on canvas and midcentury decorative arts-the May Spring Show NYC has quickly established itself as a not-to-be-missed important art fair destination for collectors, curators and interior designers. Fairfield Museum and History Center Will Host Special Great Depression Exhibition “Art for Everyone” The Federal Art Project in Connecticut March 16 – April 21, 2013 Fairfield Museum and History Center Exhibit hours are from 10 a.m. (www.fairfieldhistory.org) will host a to 4 p.m. Monday through Friday and special exhibition, Art for Everyone” 12 p.m. to 4 p.m. on weekends. MuThe Federal Art Project (FAP) in seum members are free, Cost for nonConnecticut from March 16th, 2013 members is $5 for adults, $3 for seniors through April 21st, 2013. This exhibit and students. Children age 5 and under are admitted free of charge. will feature more than 20 Connecticut artists of the FAP, who forever capABOUT THE FAIRFIELD MUSEUM tured scenes of life in Connectict on AND HISTORY CENTER canvas during the Great Depression, The Fairfield Museum and History Center using their work to change the idea (FMHC) is a non-profit educational that art was elitist to the concept that institution that hosts more than 18,000 art was actually public property to be visitors annually. The Fairfield Museum enjoyed by everyone. is located at 370 Beach Road in Fairfield, The Federal Art Project originally CT. Hours are Monday - Friday from 10 opened in 1935, giving 173 Conn. arta.m. to 4 p.m. and weekends from noon ists the opportunity to showcase their to 4 p.m. Admission is free for members, talents by documenting everyday life. Bell Bouys on Dock, Breatrice Laving Cuming, 1942 $5 for adults, $3 for seniors and This effort was spearheaded by Presistudents and free for children age 5 and under. For more information dent Franklin D. Roosevelt, who endeavored to provide economic reon exhibits and upcoming programs, visit www.fairfieldhistory.org or lief for the unemployed by creating the Works Progress Administration call the Fairfield Museum at 203-259-1598. (WPA) and the FPA, the visual arts division of the WPA. Samuel Owen Gallery is open Monday – Saturday 10:30 - 5:30; Sunday 11:00-3:00. Please call 203-422-6500 for more information. ARTHUR HEMING Chronicler of the North February 8 – June 2 See the only U.S. art exhibition featuring Lyme Art Colony member Arthur Heming, renowned for his vivid depictions of Canada’s northlands in paintings, sketches, essays and books. Organized by Museum London in London, Ontario. The Ripple Effect The arts, for many people, are personal. People draw or paint to capture inner beauty. They harmonize with friends for fun. They give their kids or grandkids ballet lessons to encourage poise. They hope theater will impart self confidence and that culture will make their children better citizens. Those of us who love the arts also believe that the arts make better people…expand their knowledge, feed their soul, give voice to ideas. Yes, it’s all very personal. come together in-person, share common experiences, hear new perspectives and understand each other better. So, let’s enjoy each other’s cultures as a bridge to ease some of the challenges and tensions we face in the world. Upcoming cultural events in Westchester include: comedian Sandra Bernhard on March 9th at the Tarrytown Music Hall, National Players performing Romeo & Juliet March 17th at Westchester Community College, Aretha Franklin Live in Concert at the Westchester County Center on March 27th, Joan Rivers at the Performing Arts Center at SUNY Purchase on April 7th and an exhibition of photographs of Hurricane Sandy entitled Who Has Seen the Wind on view at ArtsWestchester’s White Plains gallery this spring. For more of Janet Langsam’s cultural musings, be sure to visit her blog at www.ThisandThatbyJL.com. For a full calendar of arts events visit: www.artsw.org. A competition that highlights the diversity of work that is currently being made in the Northeast by emerging and established artists. bottled water, soft drinks, (before, during, and after your round), as well as your souvenir yardage book and all taxes. The pro shop is stocked with the latest in golf apparel and accessories, including top-of-the-line rental equipment in both steel and graphite, for both right- and left-handed players of both sexes. Playacar Palace What do you want to treat yourself to? Golf? A spa visit? Swimming with the dolphins? Touring around Mexico and visiting the local sights? There are various packages that, according to your tastes, include your activities and accommodations. Most of the Playacar Palace’s luxurious guest rooms and suites offer ocean views, so you can sleep with the soothing sounds of surf wafting through your window and wake to the sunrise over the Caribbean. With a choice of six in-resort dining and drinking venues (plus 24-hour room service), you can avail yourself of your choice of delectable dining cuisines in a casual setting. Foods are prepared using a mixture of the finest local and imported ingredients. Iberostar Grand Hotel Paraíso The 310 adults-only suites here include oceanfront, ocean view, and garden view, as well as two magnificent Presidential suites and 10 secluded villas. The resort boasts four restaurants, a five-star buffet, snack/bar/grill on the beach and at the pool, six bars, and 24-hour room service. Amenities include champagne upon check-in, a pillow menu, mini-bar stocked with favorite beverages, daily newspaper and shoe shine, and butler service on the beach and at the swimming pools. In addition to golf, there are facilities to practice various sports, including a fitness center with machines, aerobic, gymnastics, dance, yoga, tai chi or spinning rooms, outdoor shooting facilities, archery, tennis, basketball, volleyball, beach volleyball, table tennis, darts, and billiards. Water sports include catamaran, kayak, introduction to diving in the pool, snorkeling, and water polo. For an additional fee, guests can arrange to participate in water sports and activities such as the banana boat, boat trips, PADI diving school, jetskiing, parasailing, sailing lessons, water skiing, and windsurfing. 18 holes of pleasure and more—wherever you play With the variety of activities at your fingertops, and some of the Caribbean’s greatest golf, you can’t miss on a golfing vacation to Riviera Maya. The waters here are crystalline blue, aquamarine necklaces that embrace powdered sands gently softened by surf and sun. Breezes whisper, caressing barely clad bodies with hints of romance and passion. The sun, warmly attentive, flirts with clouds overhead, puffed and poetic, enticing dreamers to imagine fashioning a life on this idyllic tropical isle. to make sure the time-share owners at the The Ritz-Carlton, resident-wanna-bes who plunked down six figures for partial ownership and a few glorious weeks each year in an oceanfront villa, felt luxuriously at home while on holiday in St. Thomas. Hard work? Hardly. Musicians by night, beauty care distributors by day, Texans Drew McHolm and partner Jesse Boatwright moved to St. Thomas a year before we met them singing for their supper, literally, while they enriched our gourmet dining experience, vocally, at the acclaimed Old Stone restaurant in mid-island. Restaurateur Tony May, another “ex-pat” who hopped from the island of Manhattan to this 32-sq. mile isle with his own for recipe for a new life, took over the management of the Old Stone a few months ago, uniquely delighting diners with his chef’s farm-to-table menu of exotic and local fare – think wahoo with a filet of kangaroo – creatively prepared and served with panache in the midst of a once aristocratic stone mansion. There were others we met who made us lust after their life choices: Randy, The RitzCarlton tennis pro and captain-for-hire who has made a great living out of playing with island visitors, and my daughter’s college friend Mylène who coordinates dream weddings for hotel guests. Just when we thought we couldn’t be more envious of the people who successfully made the move, we had dinner with artist Tony Romano… in his art studio… at his private home… overlooking the quintessential maritime vistas of Red Hook Harbor… under a starlit night… a stone’s throw from The Ritz-Carlton… and a gazillion miles from the worries and pressures of our everyday world. Bordeaux heritage. If corks were responsible for preserving this velvety taste of Old World Europe, we stand firmly with Tony. Even before we sat down for soup, we were sold on the artist, his views and his take on island life. So when he brought out the main event, we knew we were in for a treat. His Pasta Fagiole, served with crusty garlic bread, was a party of flavorful beans, spices, vegetables and pasta that welcomed us as family. His dessert, a fresh fruit compote topped with Chantilly sauce, sweetened the deal. And his art? A bonus banquet impossibly good and impossible to replicate. As Tony generously passed around more wine, including a quickly emptied bottle of Italian prosecco, we found ourselves lamenting our plight (again.) The next morning we were headed back to the snow and ice of a Northeast winter, while Tony was headed into his art studio next to his kitchen to paint in his heavenly tropical hideaway. We rose from the table, regretfully, as we prepared to bid our host goodnight. But Tony had yet another surprise in store for us as he brought out his signature cordial, Limoncello, personally created, locally made and lusciously lemon, evoking memories of the Amalfi Coast. He poured it from an original hand-painted signed bottle into our waiting glasses and toasted our new friendship. We cherished every drop of his hospitality. We left a piece of our hearts with Tony that last night in St. Thomas, but, gratefully, brought home a bottle of his Limoncello to continue toasting island life and a chef-hosted dinner we still dream about. Over the "tapas" at Bellota When you’re dining, your eyes eat first. We watched Jordan, our tasting guide, place plate after plate before us, each visually enticing, artfully executed. We should have known we were in for a celebrity-studded line-up of appetite starters at Bellota when we saw Knicks coach Mike Woodson seated at the table next to us. That he was having dinner with his good friend, Chef Anthony Goncalves, was another hint at the star power of our talented host. Bellota means acorn in Spanish, the kind favored by the black-footed pigs of Portugal that make a meal of these tasty little morsels of nut. The chef, today a resident of Connecticut, drew the inspiration for both the name of his restaurant and his menu from his Iberian heritage. His family hails from Portugal. Anthony says they are all as passionate about food as they are about family and life. His grandmother, Gloria, and his father, Tony, taught him to cook, encouraging him to follow his passion. We’re glad he did. He’s won awards for his restaurants and received rave reviews from the best food writers in the business. Esquire magazine said he was “A Chef to Keep an Eye On.” And we did just that when we dined at Bellota on the top of the Ritz-Carlton, Westchester in White Plains. We’ve enjoyed the chef’s cooking before, having been blown away by his culinary creativity at 42. But we didn’t expect a full court press that literally set a new record for how many deliciously inventive small plates we could devour in just a few hours. The playbook was set before us as we sat down at a well-dressed table that virtually owned the White Plains skyline outside. by our waiter to melt-in-our-mouth perfection. Someone mentioned the word “full” but I wasn’t having any of it. Desserts were still to come, fortuitously saved to end the evening with a delectably sweet flourish. They made their entrance all at once… Housemade Pumpkin Belgian Waffles with maple-bourbon caramel, pecan-toffee ice cream, Chocolate and pistachio sorbet – a gelato meets Iberian ice cream encounter – the chef’s sweet interpretation of S’mores with more scoops of handcrafted ice cream that introduced a deconstructed version of those summer evening campfire favorites, graham cracker, marshmallow and chocolate, sorbet style, followed by a not-on-the-menu duet of lemon meringue cinnamon crumble and grapefruit ice teamed with lime-infused marshmallows that begged to be enjoyed again and again. It’s funny how you can get a second wind after you indulge in a fantasyland of sweets. We wanted to keep the evening going, but only had room for something that didn’t require much physical exertion. I think I only had enough strength to sip at this point so I gamely ordered a cappuccino, skim, with no-calorie sweetener, as if I was back in control. I wasn’t. My cappuccino arrived with a perfectly formed heart in the center, reminding me that when you love your dining experience as much as we did that night, resisting temptation is futile. No wonder the Chef and the Coach are such good friends. Both demand excellence, expect accountability, have a passion for the game and inspire a team of seasoned players and newcomers to work, seamlessly, effortlessly as one big happy family who blend well together and compliment one another in perfect harmony. Way to go! Which leads us to comment on Chef Anthony Goncalves’ corporate tag line for Bellota and 42, “It’s different up here.” Here’s where we come out on it. It’s not just different up here. It’s spectacular. A Magical Evening... ...with flare, elegance, stimulating company, great food, and champagne! elcome to Turnberry Isle, Bourbon Steak, and Krug Champagne. Is this Magic, you ask? No, it is Miami at it’s finest dining hour. Where else can a normally boring Wednesday night turn into flare, elegance, stimulating company, great food, and champagne? Such was my Wednesday. I had the pleasure of being invited to partake in one of the seasons must lucrative events, Krug Champagne and Dinner at Bourbon Steak Miami. Our host Carl Heline, U.S. director of Krug, graciously greeted all those attending with, of course, Krug Grande Cuvee. A burst of fresh, crisp citrus bubbles began as the “Teaser” of the evening. The rest is, as they say, History. A Kusshi Oyster topped with Petrossian Caviar in a Burrata Spuma, along with Alaskan King Crab in a key lime vinaigrette Brioche, and a Tuna Tataki in lemon, togarashi and fresh wasabi were ALL paired with the Krug 2000 Vintage. The result was a mélange of velvet and silky textures bathing in my palate. While my senses recovered, our host informed us of the Champagne’s history, the non-conformist and revolutionary philosophy of Joseph Krug, the six generations of the Krug family still involved in its production, and of its exclusivity. It was refreshing to hear that this Champagne House has only 51 employees, and produces 35thousand cases yearly. We then proceeded to the second course, Smoked Diver Scallops “Shasu Shasu” with Hudson Valley Foie Gras, and Maitake Dashi; paired with Krug Grand Cuvee. The main course was Crescent Farm Duck Breast with a crispy thigh confit, blood orange, and a Parsnip Puree; paired with Krug Rose. Now I will take a moment to say that all those around me OOOOD and AHHHHD as they indulged! We also were “given” a special “treat”. We were served two “vintages” of the Grand Cuvee; a 2005 and a 2011 release. Let me explain that the Krug Grand Cuvee is a blend of approximately 120 wines whose bottling age may span ten to fifteen years, so there is no true “vintage”. With that said, the two “releases” were a lesson on how “bottling” time enhances the wine, assists in its evolution, and destroys the “myth” that so called non-vintages can not be “cellared”. In fact, Mr. Heline insists that their champagne may be consumed 100 years after bottling. I can only attest, my avid reader, that the Grand Cuvee bottled in 2005 had intense flavors, layers of powerful fruit, structure, a beautiful beer bread nose, and a striking topaz color. The Grand Cuvee bottled in 2011, although crisp, full of citrus notes, and a delicately pale yellow color, was shamefully dwarfed by the “older” bottling. Lesson to be learned, both are beautiful but when compared, well, one will always be left behind. Which one, you ask? Depends on your palate and your preference. Mine is obvious! The night ended with Artisanal cheeses, and a 1968 Madeira, D’Oliveiras Boal. Wow! Needless to say, it was a hit. Many Thanks to All involved in this Magical Evening! Fire Escape II, 1953. Oil on linen canvas. 30 1/4 x 8 1/2 inches. Collection of the Coleman Barkin Family. January 24 – March 24, 2013 Fairfield University Fairfield University celebrates the life and work of this bold 20thcentury Realist in two exhibitions spanning her seven-decade career. Landing Back In New Orleans “Welcome! You’re in our world now!” Chef Carl Shoubut said as we slid into the banquette chef’s table in the sparkling kitchen at Commander’s Palace in New Orleans Garden District. There’s no more coveted experience in this special world than dining in the front seat of one of American’s most celebrated kitchens. ter. “Be a little bad—that’s what New Orleans is all about!” Each has their own way to find their “bad” in the Vieux Carre, or in the Quarter as locals call it. Is it a bad thing to wish the bartender at the Carrousel Bar a hearty “Good Morning” while ordering a Gilbey’s gin martini straight up? Nothing feels as good as that second order of hot, powdered sugar beignets at Café du Monde! And, if you ask for a floater and a to-go cup for that Brandy Rum Punch at the Loew’s Swizzle Stick Bar—the bar keep will assure you it is a very good idea. The Inner Beauty of Skeleton Watches By Cheryl Dixon They’re not naked… they’re skeletonized. It’s the inner beauty that makes skeleton watches so very appealing. Intricate mechanical watches becoming more and more popular… and skeleton watches (in which the movement is visible through either the front or back of the watch), are making a comeback. Watch brands like Patek Philippe, Jaeger-LeCoultre and Vacheron Constantin are introducing modern versions, and vintage skeleton watches, at the height of popularity in the 1970s, are once again objects of desire. Skeleton watches are unique, and at the same time vintage and on the cutting edge of technology and fashion – capturing the attention of modern watch enthusiasts and vintage collectors. Especially as brands are introducing modern versions of skeleton watches, collectors’ interests in vintage models have been steadily increasing and their value is being realized. A collection of rare and unique skeleton watches was recently sold at Antiquorum’s auction in Hong Kong. Interest in and competition for these extraordinary timepieces drove up auction prices, clearly not an obstacle to the collectors lucky enough to now own these masterful works of artistry and craftsmanship. Patek Philippe (Ref. 918/4) An ellipse-shaped skeletonized keyless dress watch made in 1996. Extremely fine and rare, skeletonized, 18K yellow gold, diamond and emerald-set keyless dress watch set with a total of 109 diamonds weighing 0.60 carat. The watch features an 18K yellow gold Patek Philippe long chain and cord fob. Accompanied by the original fitted box, the Certificate of Origin, Extract from the Archives, and registered guarantee card and papers. Sold for $73,726. Cheryl Dixon is Vice President of Marketing and Communications for Antiquorum Auctioneers. Established in Geneva in 1974, Antiquorum has carved its own unparalleled niche in the auction world through its focused expertise in horology and by cultivating a thriving collector’s market for timepieces worldwide. For information on buying or consigning watches and free evaluations of your fine timepiece, visit www.antiquorum.com. VACHERON CONSTANTIN (Ref.43580) - A very fine and rare 18K platinum and diamond self-winding skeletonized wristwatch with an 18K platinum and diamond Vacheron Constantin buckle. Made in 2006. Accompanied by a box. Sold for $46,723. BLANCPAIN "VILLERET" (No. 80) - Very fine and elegant platinum skeletonized wristwatch with a platinum Blancpain buckle. Made in 1990s. Accompanied by a fitted box and guarantee (blank). Sold for $9,666. AUDEMARS PIGUET - Very fine and elegant 18K yellow gold self-winding skeletonized wristwatch, with an 18K yellow gold Audemars Piguet buckle. Made in 1980s. Sold for $19,333. Some notable modern examples: Patek Philippe 5180/1G-001: An example of impeccable craftsmanship, the watch’s movement is displayed with the hand pierced and engraved caliber 240 with its thin bridges and micro-rotor in a delicate case with attached gold bracelet. It is signed on the movement with a hand-finished signature around the mainspring barrel. Jaeger-LeCoultre 16124SQ Perpetual Calendar: Skeletonized watches meet technical ingenuity in the Jaeger-LeCoultre 16124SQ wristwatch featuring a perpetual calendar. The 260 parts that compose the movement allow the wearer to not only see the time, but provide all the normal functions with a perpetual calendar including the day, date, month, year and moonphases as well as providing a day/night indicator and power-reserve. Vacheron Constantin 85050/000R-20P29 Quai de L’Ile Day-Date and PowerReserve: In this model, one of the oldest watchmakers steps into contemporary bold design, even allowing buyers to customize many elements. The transparent dial combines both a transparent sapphire with frosted and engraved sapphire reserves and sections. ROGER DUBUI, Horloger Genevois, “Pink Gold Square -Flying Tourbillon,” made circa 2005 in a limited edition of 28 examples. Very fine and rare, large, curved CULTURE/ /MAGAZINE square, water-resistant, 18K pink gold wristwatch with one-minute flying tourbillon regulator and a 18K pink gold Roger CONTEMPORARY Dubuis deployant clasp. This watch is 59 number 27 and is accompanied by a Roger Dubuis wooden box. Sold for $46,723. decked out in green outside the patio door! Weather permitting, a well-designed outdoor living space can often times be the most utilized area for a family. An attractive outdoor living area is also a great selling point for a home and can significantly raise your home’s value. Outdoor furniture is an important component of your outdoor living space and is available in all styles and for all budgets. Weatherproof furniture comes in a variety of materials such as wicker, plastic, metal, wrought iron, aluminum, or wood. Another thing to consider is whether your outdoor living area will be covered or not. Some people choose to enclose their outdoor area, while others have only solid roofs or open pergola type coverings. If you need shade or perhaps an umbrella, awnings can be another good option as they are available in a wide variety of fabrics and sizes, and can be attached directly to your home. They offer a very unique look and also add to the home’s value. If you plan to use your outdoor living area at night, keep in mind you might also want to add outdoor lighting. Windproof, fire-safe and attractive, hurricane candles can be used as a natural light source. They add a romantic mood to any setting and create an intimate feel for all atmospheres. Solar lighting is also a growing trend for outdoor areas. The ease of not having to run electrical wiring makes this an easy option for everyone and is also very eco-friendly. At Eclectic Elements we use low voltage and solar lights that come in a variety of styles to compliment your space. If your space doesn’t allow for a pool, the trickling sound of a water feature will be soothing and add a natural element of relaxation. Outdoor fire pits and fireplaces add warmth and coziness at night, while enhancing the ambiance when the sun goes down and the stars come out. Even the landscaping plays a big part in creating that picture perfect outside living area. For more design tips, visit www.eemiami.com or call me, Monica Suleski, at 305-773-7467. Rows of trees and bushes provide privacy – and shade. Flowers add natural fragrance and color. And greenery of all kinds adds a freshness and dimension that can’t be duplicated inside. Most importantly, be sure your outdoor living space is safe and works well for your needs and budget. With a little bit of planning, anyone can create an outdoor living space that can provide years of enjoyment and recreation for their family. Check List for Outdoor Rooms Fabrics: Durability and maintenance are top considerations in choosing materials for outdoor living spaces. Many fabric materials designed for outdoor use resist fading and water. But if they get dirty or get soaking wet from time to time, they will be prone to mildew problems. Keep covers on your upholstered furniture to keep it looking good longer. Counters: Granite is a great choice for outdoor counters. It is good looking, is impervious to water and is easy to maintain. Leathered and wood surfaces tend to attract dirt and mildew. Backsplash: Tile backsplashes are the preference of choice because they are so easy to keep clean. Stucco, while it is often cheaper, is difficult to clean when it gets dirty, which it does, quickly! Cabinets: Unlike wood, stainless cabinets will hold up to the elements and deter animals from trying to open cabinet doors. Lighting: Good lighting is key to adding ambiance and atmosphere to your outdoor space. Layer the light, shine it up in trees and down from branches on to your open seating areas. Be sure to choose UL-rated lighting fixtures approved for outdoor use. Even in a protected area, the fixture will be exposed to wind, dust, and moisture. “You’d better get a 3,000 mile extension cord”, teased my friend when I told him that I wanted to drive coast to coast in the new, all-electric Tesla. it out of the Mall right now, I could go 206 miles without a recharge. Pretty impressive! The salaried (non-commission) sales team was absolutely great. No pressure and no attitude at my ignorance. They started my Tesla education by telling me that the top of the line version of the Tesla, the Model S Performance has the largest battery (85 Kw), most horsepower (416) and an impressive 4.4 second time to 60 mph. The sales person then asked me to check out the Tesla’s generous trunk. I instinctively walked to the back of the car when I noticed them opening the front hood. I made a quick U-turn and joined the sales people at the front wearing my “I knew the trunk was in the front” poker face (after all, I drove a VW Beetle in my College days). However, I got a big surprise when I was also invited to the rear hatchback featuring a second, even larger storage space (32 cubic feet combined)! However, I’m sure that I could not disguise my puzzled look when I wondered where the electric motor was located. Apparently it is mounted very low between the rear wheels and is never in view. I also asked about the battery location because unlike other electric and hybrid cars, the Tesla S does not have a particularly high center tunnel where a plug in electric car’s battery is typically located. In fact, the Tesla’s battery is very thin and covers most of the flat platform of the vehicle underneath the passenger compartment. One of the issues that my car buddies had brought up the day before was the short life and adverse environmental impact of replacing the battery. Apparently Nikola Tesla would be proud, as even those issues have been ingeniously resolved. After all, why go electric to stop polluting the air and then ruin it all by dumping a caustic battery in our land fill. First, I learned that Tesla’s batteries are warranted for up to 8 years/Unlimited Miles. When they finally have to be replaced, Tesla recycles the battery materials. In addition, climate factors (i.e. extreme heat or freezing temperatures) which can severely impact battery lifespan are regulated by imbedded systems in the vehicle. Most important to my fantasy trip, the battery in the top of the line model has the largest travel distance range. That is, once the battery is fully charged up, I could drive up to the maximum range of 300 miles between charges. See, I told my friends that I could make California……even if only a tenth of the way at a time! Now I’m thinking of all the relatives who I could visit on my coast to coast run. I’d never outstay my welcome, because after a quick coffee with each one and, of course, the obligatory connection with their electrical outlet, I would be on my way. However, if you are not welcomed by your relatives, don’t worry. Tesla is further supporting their cars by installing battery charging infrastructure systems (Supercharging) on select US highways (there is already one on I-95 in Connecticut). Amazingly, these roadside high rate chargers will restore 50% of the driving range in as little as 30 minutes and its free. Another thing which really impressed me is the high level of customer service and convenience that Tesla is all about. I recall from my introduction at the Mall, that once my car is built, Tesla will deliver it directly to my home with all the paperwork, insurance, and registration completed. Door to door service pickup and delivery is also available. Nice touch! The base model starts out at $49,900, but can go much higher. In fact when I went home and opened Tesla’s web site I was introduced to their clever “Design Studio” program. After building my fantasy car, including all the goodies on the top of the line Model S Performance, I more than doubled that price tag. I know that I can’t swing that amount of money right now and am hoping that Tesla will pity this poor Journalist and at least let me drive a Tesla S to Washington, D.C. According to Google Maps, it is only 285 miles from my house to the White House. If President Obama lets me park in the front portico at 1600 Pennsylvania Ave, I’ll only need a 25 foot extension cord! acteristics, with the base and the wall units of the Polished Glass version of the Elektra model with an aluminum frame and a Less Marine® handle, all in black. The structures are all made of aluminum, so as to be resistant to external agents and free from harmful emissions, as well as being much lighter. Moreover, the “Nuvola Stripe” hanging hood, retrieves space and guarantees greater suction. Finally, the innovative push-button locking system, in-built in the Less Marine® handle, on the thickness of the door, designed and patented by Ernestomeda, prevents the inadvertent opening of the doors no matter what the sea is like and at any speed. A large aft hangar with a folding bridge allows for the stowing of a 5m tender. Pershing 108’ has a second hangar that can contain water toys as well as their davit launch. With its highly innovative design and its unparallel performance, the new Pershing 108’ rightfully presents itself as being among the most representative models of the nautical world, testifying the continuous growth of Pershing in terms of research and development that aims at transforming materials, housing solutions and technologies into something new and truly unique. Garage Find. Los Angeles Modern Auctions after 22 years. Oldenberg Family Collection. sold placing Bonham’s Motoring department clearly on the map. The spectacular offering of automobiles from the Oldenberg collection commanded the day with the much-anticipated 1972 Lamborghini Miura SV selling to a private European collector for $1,215,000 considered to be one of the first muscle cars. James Knight, the Bonham’s Group Motoring Director stated, “It was a tremendous auction, and everything worked beyond our expectations. We achieved prices at this auction that created new benchmark figures and offered advice to our clients that proved to be wholly founded.” Further examples from the sale included the 1968 Ferrari 330 GTS Spider, one of several Prancing Horses well sold by Bonhams in Scottsdale that brought $912,500. And the rare supercharged 1938 MercedesBenz 540K Cabriolet A sold, within hours, after the auction for $1,312,500. This sale leaves Bonham’s a clear competetor in the US. We look forward to their next block buster sale. Portrait of a Woman Mixed Media, 33" x 40"
Mixed Media, 40" x 32"
Bonnie Raitt’s description of Jon Cleary cuts right to the matter: “Jon Cleary is the ninth wonder of the world.” Born in England and bred in New Orleans, Louisiana, Jon Cleary is a triple threat, combining soulful vocals, masterful piano skills, and a knack for composing infectious grooves with melodic hooks and sharp lyrics. music will always be with us, their shows always viewable on disc or YouTube, it is the knowledge that they are still with us which, somehow, provides comfort, a comfort that we have always known and maybe taken for granted. I don’t know what the world will be like without it. While it appears that they may indeed play a limited number of more shows, the end of the existence of The Rolling Stones as a touring, album producing entity is clearly in sight. Those of us who love the band have always dreaded this time. Their fiftieth anniversary tour, limited to just five shows, is a clear signal that The Stones are near the end of the line. Happily, they are going out as they have existed for the past fifty years: The masters of their craft. Even in their late sixties and early seventies, they simply never let us down. Is there really a drummer whose abilities surpass the sublime dependability of Charlie Watts, even at age seventy one? Has there ever been a rock and roll front man with the ability to command total control of a football –stadium-sized-crowd like Mick Jagger? And Keith Richards is the author of a sound that did not exist before he invented The Rolling Stones. Without him, bands like Aerosmith and Led Zeppelin could not have been possible. And fifty years after they began, there will be no artist or band to which The Rolling Stones can pass the torch that bears their identity and legacy, The World’s Greatest Rock and Roll Band. While we will still have, as Keith Richards tells us, the sun, the moon, and the air that we breathe, waking up each day without the possibility of the announcement of a new Stones album or tour will be an adjustment for their fans. And we will never say goodbye. intervention with his deft installation of many problematic galleries. Corners turn nicely, visual axes flow effortlessly, and surprises await with little nooks and crannies which allow pauses like airy cadences in a Vivaldi concerto. The Muhammad Ali knock-out moment is a stunning double punch hanging of two Mark Rothko’s. Hovering in an eerie silence like Kubrick’s 2001 monolith, the Rothko shrine opens to an ethereal contemporary gallery giving MoMA’s fourth floor a run for their money. With over 4,000 artworks on display including textbook examples of the arts of classical antiqutity, Asia, Africa, Indo-Pacific, and of course the entire western canon from Pollaiuolo to Pollock or Lippi to Lichtenstein, a visit to the Yale Art Gallery is not an optional “do it when I get a chance”. Re-arrange your calendar, cancel that unnecessary waste of time visit to the mall, or take a mental health day off from your job, but make time to relish what awaits. Yes, Yale has proudly displayed its artistic treasures for centuries – but trust me - there’s nothing “old school” about the new art museum. Michael Goodin, Dean Cundey (DP), Jamiyl Campbell (Background, Production Supervisor), Michael Orefice (Gaffer), Jenna Dayton (Script Supervisor) and John Allegra (Animal Wrangler and Horses) on the set of Something Whispered. Photo by Robert Carne. Michael Goodin and Peter Cousens converse on set. Photo by Robert Carne. development of the industry here, I am more confident that the crew base can support projects such as ours.” The Film Industry Training Program, which was almost slashed from the budget last year, has survived and is now paying dividends to filmmakers who now chose to bring their projects to Connecticut. As the industry continues to grow in Connecticut, more and more of the state’s residents are finding work on film projects. Michael Goodin has bridged the gap between Hollywood and Connecticut, and is poised for success on a major scale with Something Whispered. The programs within Connecticut that support filmmaking will certainly help pave the way for others to follow in his footsteps. Stay tuned… Something Whispered is slated for completion in late spring 2013 and will be in the major festivals next fall. cabulary that spans a hundred years. It’s quite varied, but it’s all New Orleans. There’s a common denominator between all the musicians that come out of this city. So you can assemble bands here, very easily. Everybody know exactly what’s required, and they draw on the same rich tradition which started with early New Orleans jazz men and went through R&B and soul, Latin influences, all kinds of stuff. I decided I needed to be home to work on the music. We have some trips coming up to Japan, to Canada, some other gigs in South America. So there are always tours happening. But if I’m on a roll musically and have that sort of creative agenda particularly going, I like not to stray to far from it. I like to be close to all my instruments, something you can’t really do if you’re in a hotel room in the middle of nowhere. For The Quick Center, will you be playing a variety of instruments? I’ll be focusing mainly on the piano. Piano in the New Orleans context is really a percussion instrument. It’s a great vehicle for playing the funky side of R&B stuff. And that’s what a lot of people like. And with the trio context, there’s a lot of room for me to kind of stretch out and play the piano. That seems to be what people like, so that’s what I give them. Making a MirAcle Florida's Actors' Playhouse Celebrates a Quarter Century of Theatrical Excellence “It all started with a toothache,” claims Barbara S. Stein, Executive Producing Director of Actors’ Playhouse in Coral Gables, Florida. And, though she says it with a laugh, Stein isn’t kidding. ll it took was a visit to the dental office of Stein’s husband, Dr. Lawrence E. Stein, by the head of one of the state’s largest chains of movie houses to set in motion a series of events that led Actors’ Playhouse to 25 years of producing professional theater in Florida’s Miami-Dade Country. As Barbara Stein remembers it, Michael Brown, the President of Wometco Enterprises, had come to see her husband with a dental emergency. During the time he spent in the chair, Brown mentioned to Dr. Stein that he was attempting to sell the lease to a twin-plex cinema in a strip mall near the couple’s home. “My husband and I had been going to that mall for years,” Stein explains. So, the doctor was very familiar with the theaters that Brown was taking about. The twin-plex was located in Kendall, a bedroom community in the southern part of the country. But, in the loss of that cinema Dr. Stein instantly saw an opportunity: the chance to bring live theater to town -- something he felt the area sorely lacked. And his wife agreed. Barbara Stein had grown up in Miami after moving to Florida when she was eight years old. “There was no culture,” Stein insists. “It was a dream to go to New York City to see Broadway shows. But, it wasn’t part of what you did.” When Barbara and Larry Stein met at the University of Pennsylvania, however, he introduced her to the pleasures of attending legitimate theater. Dr. Stein had been raised in Philadelphia where his parents had exposed him to plays and musicals from a very early age. So, he was eager to share his passion for the stage with Barbara. After they were married and moved to Florida the Steins continued to see shows as often as they could. But, the theatrical pickings were fairly slim. Walk up the stairs. Turn right. Relax. All fractional aircraft offered by NetJets ® in the United States are managed and operated by NetJets Aviation, Inc. Executive Jet® Management, Inc. provides management services for customers with aircraft that are not fractionally owned, and provides charter air transportation services using select aircraft from its managed fleet. Marquis Jet ® Partners, Inc. sells the Marquis Jet Card ®. Marquis Jet Card flights are operated by NetJets Aviation under its 14 CFR Part 135 Air Carrier Certificate. Each of these companies is a wholly owned subsidiary of NetJets Inc. ©2011 NetJets Inc. All rights reserved. NetJets, Executive Jet, Marquis Jet, and Marquis Jet Card are registered service marks. *Advance notice requirement depends on the type of aircraft purchased or leased and on the size of the interest acquired.